Is it September already? Goodness. Welcome to the newsletter – this last month we’ve made some major changes to the interface, made huge strides with our ambitious early access levels, fine-tuned a dynamic music system, and improved the fidelity of the artwork. There is one important issue that needs to be discussed right away – it’s looking increasingly likely that we won’t hit our summer 2017 target for early access build. This is as frustrating for us as it is for those of you waiting for it, but let us be clear of the reasons. We’ve realized that we simply can’t rush to meet that deadline, because that would affect your experience with the game. You’ve all been incredibly patient, understanding, enthusiastic and just downright lovely about our little project – and you deserve as good a game as we can make. We’re unwilling to compromise on quality for the sake of time. Our hope is that our game will feel very polished for an early access title, with several hours of solid game play and all the supporting systems working properly. We’ve been working on a strict interpretation of what counts as “summer” – in the UK, where the team is based, September 22nd is its final day. We still hope to have our closed beta ready for around this time. The beta will take a few weeks, after which we will be unleashing early access upon the world. So, given this plan, you can see that the delay is weeks rather than months or years. Now, to more cheerful matters. Here’s what we’ve been working on over the past month. Our game starts on a beach. Once John, our lead level designer, finishes a level he hands it over to artist Matt for what is known as an art pass. Matt adds plants, stones, and variations to the textures to make the whole thing look beautiful. 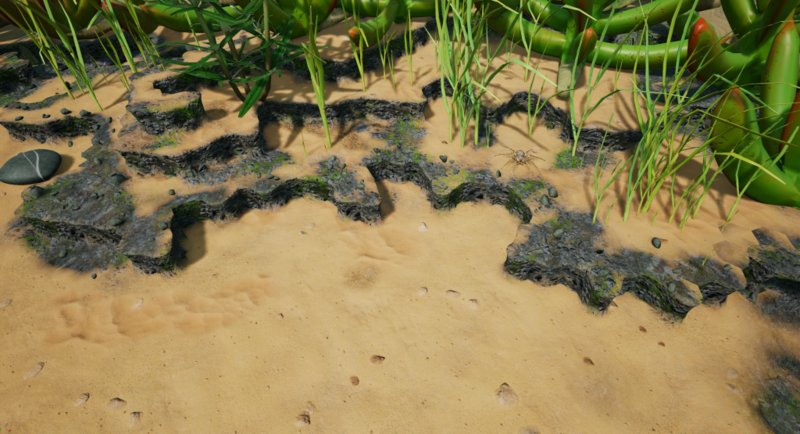 This month, Matt has been working on making the textures better for the beach and its various flora. We’re very pleased with how the game is shaping up visually. There’s one overriding rule when working on any form of software – nothing works the way you intended it first time. In a game this is down to two things – glitches (or bugs) in the software, and issues with balance. 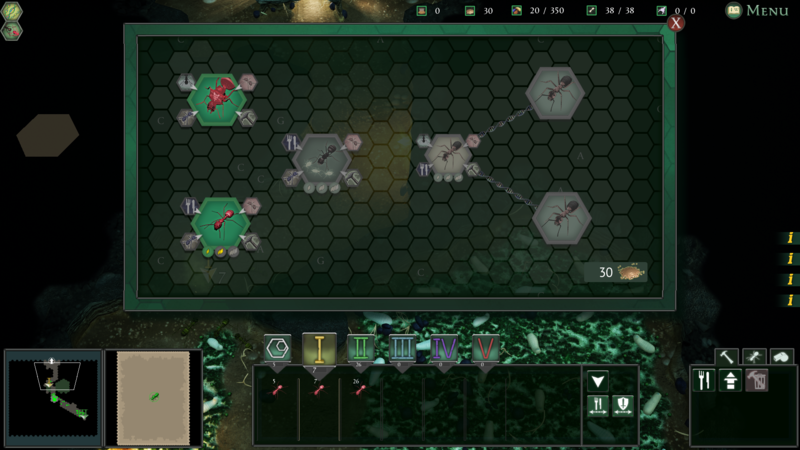 Debugging is a crucial process, and Empires of the Undergrowth deals with some rather complex algorithms for things like path-finding (a creature working out the best way to get from A to B) and decision making. 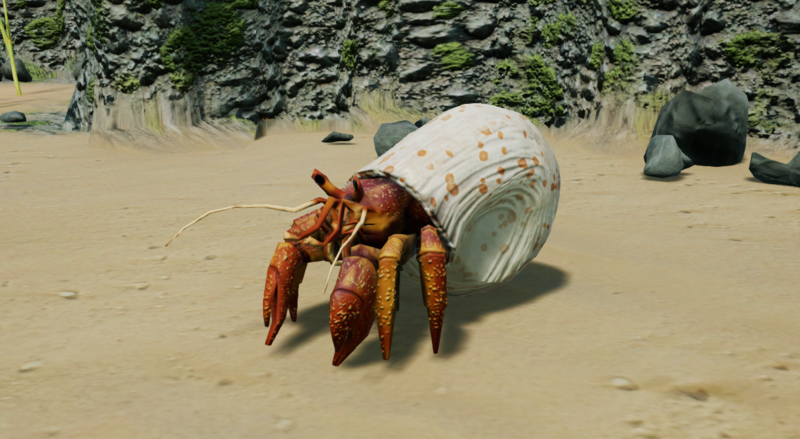 In the video below, John has set up a simple visual representation of the area the hermit crabs are trying to get to, in the form of cubes. If they don’t get there, he can see that something’s wrong. It’s often very helpful to create simple visual aids like this during the development phase. Don’t worry – there will not be random cubes appearing when you play the game! When we say “balance” we mean the adjustment of numbers such as creature health, speed, and attack strength / frequency. Because units are tied to a food cost, it is possible with the change of a single digit to make them horribly overpowered or pathetically weak. In the below video, John has made a simple level that allows him to spawn any unit for two opposing armies. By observing how well they do against each other, he can ascertain if the various units are fairly priced or statted. Without seeing it in action, it’s a very difficult thing to predict. As a side note for this video, we asked if you would like such a tool to play with opposing ant armies, and you seemed enthusiastic! Look out for that. As much as we liked the more natural looking, rocky theme of the interface in the demo (and even the plant-themed one from older builds), as we continue our plan to make the surface a major component of the game we realized the darker, earthier look is too contrasted with the usually brighter surface, so we’ve slimmed it up and made it more functional. You’ll notice some extra buttons and functions too – we’ll be talking a bit more about them in the future. In short, the UI changes are designed to make the whole game feel more cohesive, whilst giving us more space to add extra functions, because we know you RTS fans like your options to be open. As an added bonus – the way we have things set up with the new UI, there’s no reason that we couldn’t in the future add a way to move the modular windows around to your personal preference. As Liam composes the music for Empires of the Undergrowth, he tests how it’ll work using Audacity (an open source multi-track audio editor). As you see here there are several tracks playing in unison. Liam simulates the dynamic music system he’s implemented by fading some tracks out and others in. 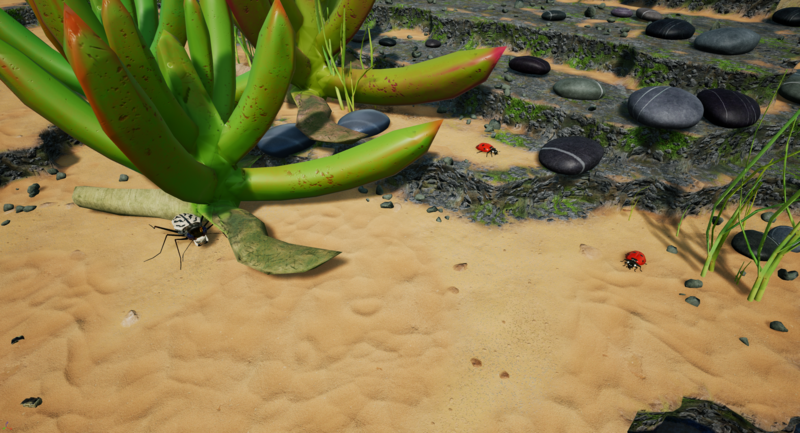 In-game, the scenario here would be that the ants engage in battle with some creatures, causing the music to become more dramatic and military-sounding. Once the battle is over, the music settles down again to something more baseline. We’re hoping the dynamic music system, which responds to how your colony is faring, will really increase the immersion levels and increase the “documentary” feeling we’ve been going for along with our narrator. 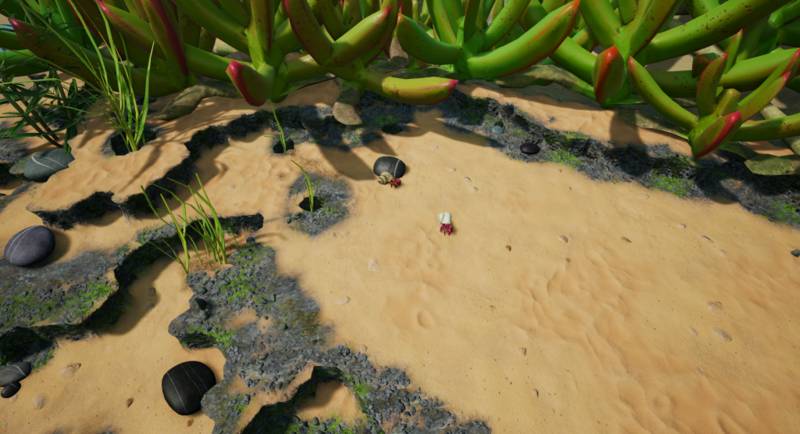 Empires of the Undergrowth is a real-time strategy game. So we have the same concerns a traditional RTS has – such as alerting the player to an attack! In the below setup, Liam is testing code he’s made to identify where on the map a battle is happening, and how severe it is. The location of the spheres that appear is where the code has identified a threshold level of damage being done, and the size of the sphere represents how intense the fighting is. This will allow us to add alert icons to the minimap – informing the player of a fight and giving them a chance to respond. Our narrator will also do his best to keep the player up-to-date with their colony’s conflicts. Saving and loading is no easy task for a game. Essentially when you save you must decide on each piece of information you will need to restore the game on loading, then store them. You can probably appreciate with an ant colony game that is a lot of different objects (tiles, food, eggs, ants, creatures). Additionally, you must be able to restore the AI if you wish the creature to be doing the same thing when it loads. Saving is of course only half the battle. When a level is loaded, the default setup of the level opens first, then all default food, creatures, eggs and other things are removed. New objects are created for everything (so for example the queen is an entirely new queen on load) and these are then fed to stored values from the save. It is a slow process to get right. 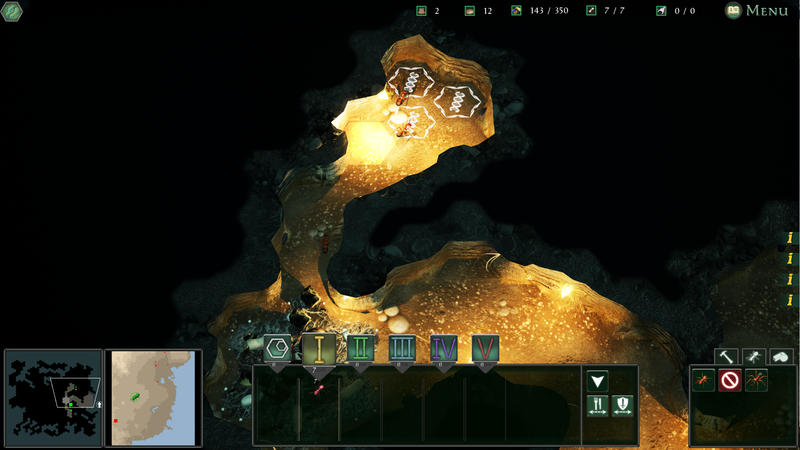 Saving will initially be available in Formicarium mode at early access launch. This is crucial as your Formicarium colony is one you will be returning to after you have finished a mission. All creatures, dug out tiles, built rooms, eggs, food items, pheromone markers and what the ants are doing are restored in this game mode (as well as your resources) so you should be able to keep all progress of your colony. Here’s how the tech tree / upgrade system is looking at the moment – more to come on this over the following weeks!